My approach to research fuses, like a jazz composition, varied and sometimes discordant elements that answers the questions: when, who, what, and why - the full dimensions of scientific inquiry. It proactively seeks, promotes and provides early engagement for all God’s children in one of the most consequential adventures known to humans. The motto of BEST Early: People First, Innovate Early captures this approach. The what and why of my research focuses on organic synthesis, novel processes and products with an eye on useful applications, such as in the biological, environmental or material sciences. While when and who is manifested in longstanding efforts towards universal adoption of early research participation (ERP), which engages students in research earlier than traditionally done. Early research seeks to nurture the natural curiosity and inventiveness of students and to develop their critical thinking skills and confidence as independent investigators or in simply approaching everyday problems in whatever career paths they choose. More details about early research is described in my 2016 book - The Power and Promise of Early Research. The first chapter Early Research: A Strategy for Inclusion and Student Success provides an excellent overview of the when and who of research. These activities and objectives are supplemented by public science initiatives, such as, YouTube videos, Public Science Announcements and LabTales published online and in the Benton Spirit Community Newspaper. Two underlying themes of our synthetic organic research are: small and simple. We make small molecules using simple processes. The 'small' focus of our research program is derived from the simple observation that most classes of important biological molecules – amino acids, nucleic acids, carbohydrates – are small molecules that contain functional groups uniquely and densely juxtaposed. Undoubtedly, this structural – regiochemical – feature of natural products is highly correlated to several important emergent molecular properties: (a) complexity, (b) diversity, (c) multivalency, (d) biochemical networks, and (e) ‘higher order’ biological functionality, that is, life as we know it. The second theme - simplicity - defines our approach to making small molecules. 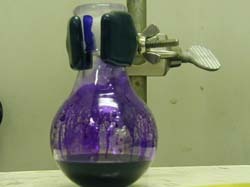 A simple synthesis is reliable, atom efficient, environmentally friendly, scalable and cheap. Consequently, addition and rearrangement organic reactions, in which all atoms of the reactants are retained in the desired product, are 'higher order tools' for small molecule synthesis. Our fusion of 'small and simple' has led to new compounds, functional materials, synthetic processes and applications ranging from molecular sensing to hybrid biologics. We are using this small and simple approach in a variety of research projects that include: agglutinators, fragrances, hybrid drugs, hybrid pesticides, liquid crystalline biological stains, nanoparticle linkers, novel surfactants and transfectors, new synthetic methods, and sensors. This small and simple approach also facilitates and seamlessly integrates with our early research participation (ERP) initiatives. It is the basis for our interdisciplinary collaborations in agricultural science, antibacterials, biomedical diagnostics, cancer research, environmental sensing, materials science, and nanoscience. It engages early researchers - high school and college - who often develop projects that lead to undergraduate Honor's research theses and graduate research dissertations. (h) Design, Synthesis and Applications of Novel Multicationic Dyes.